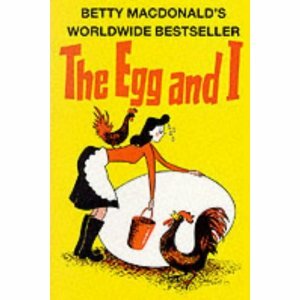 The Egg and I is a funny memoir about a woman who follows her husband on his quest to become a chicken farmer. It was originally written in 1945, became a bestseller, and has been reprinted several times. This was a book chosen for my book club read, and I was looking forward to some good laughs. I have to say there were some really good laugh-out-loud moments and the author is a good writer, but overall, the descriptions of farm life made it a tedious read for me. The book has a slow start, and the author does not relate the two years or so she spent in the Olympic Mountains in chronological order but rather by seasons. Sometimes this made her story hard to follow. I can pinpoint the accounts she tells of her life that I enjoyed and found interesting, but the details upon details of farm life and especially the chickens had my eyes glazing over or my head nodding off. What I found disappointing was that although she was pregnant when she first started on the farm that detail is only mentioned almost half-way through! And there is almost no details of her pregnancy, labour or moments with her little daughter. It was all about the farm! The extremely hard work on the farm, the hard weather conditions on the farm, the crazy neighbours and their farms, the Indians and their problems, the chickens on the farm, more about the chickens on the farm and so forth. She and her husband lived like roommates even though they were newlyweds. She describes their life like workmates. Besides her frustration with her husband's oblivion to her feelings about the farm, the author does not delve deep into emotions, whether for her husband or daughter. It was a superficial read for me. In addition, there is much religious profanity, not on her part, but coming from the neighbours. The ending came abruptly and with no new revelations. The book just ended. I was relieved when it did. Disclosure: I bought this book on Amazon. I was not told how to rate or review this product. Wasn't there a movie made from this book years ago? I guess the fact that they lived like roommates is a reflection of the time. Yes, there is a movie version of this book. I have a feeling it may be better than the book. Hi, i am currently reading this book, and yes it does have me nodding off too!! Way too much description of the work in the farm. I have been reading a lot about the author on the internet, and it looks to me she was not happy with her first husband [even as she is writing the book]. She has chosen to however 'laugh it off' in the book. Of course, i am thinking this way because i know what was to come later.